The ocean has an enormous impact on Earth’s climate and the quality of our lives. 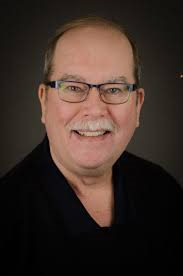 In this talk, Dr. Eric Lindstrom will show us how NASA senses many properties of the ocean from an array of satellites in Earth-orbit and the impact of these measurements on the science of oceanography and climate. Some of the topics to be covered include sensing the changes in global sea level and the mass of the great ice sheets, the interaction of the ocean and atmosphere through sensing of sea surface temperature and surface wind vectors, and modeling of the surface circulation of the ocean and its interaction with marine debris including plastics. NASA’s Earth Science Division maintains a constellation of satellites that assist in monitoring and understanding the land, sea, and atmosphere of our Home Planet. The science of physical oceanography has been transformed in the last 30 years by the advent of satellite oceanography that now provides precise global measurements of sea level, bottom pressure, surface winds, sea surface temperature and salinity, and ocean color. These measurements provide a global synoptic view that when combined with a traditional ship-board perspective allow for an expanded realm of scientific inquiry and practical applications. President Larry Millstein called the 2377th meeting of the Society to order at 8:11 p.m. He announced the order of business and welcomed new members. President Millstein presented a summary of the 36th meeting of the Society, held in 1872. The minutes of the previous meeting were read and approved. President Millstein then introduced the speaker for the evening, Eric J. Lindstrom, the Program Scientist for Physical Oceanography in the Earth Science Division of the NASA Science Mission Directorate. His lecture was titled “Our Blue Planet from the Vantage Point of Space”. Dr. Lindstrom began by explaining that the ocean gives us much of the protein, minerals, transportation, and energy critical to modern society. We depend on the ocean for our way of life and on oceanographers to understand the health of the oceans, including how human activity is affecting them. Dr. Lindstrom summarized the state of the ocean today as getting “hot” and “sour”. Hot because the ocean acts as a massive heat sink, absorbing 90% of the greenhouse heat that would otherwise go into warming the atmosphere. He showed satellite photography demonstrating a precipitous decline in the area of Artic sea ice since the year 2000, and satellite gravitational surveys demonstrating similar retreat of ice sheets in Antarctica and in Greenland. Greenland alone loses on average 280 gigatons per year. Dr. Lindstrom pointed out that warming water raises sea levels not only because the volume of water increases due to thermal expansion but also because warm seas further melting costal ice pack. Dr. Lindstrom describes the oceans as “sour” because the ocean is becoming acidified as it absorbs atmospheric carbon. He explained that the ocean absorbs about one third of the carbon dioxide in the atmosphere, which creates carbonic acid near the surface. The ocean today is now 30 percent more acidic than it was before the Industrial Revolution, which affects marine life, particularly coral reefs and shellfish. Dr. Lindstrom explained that the volume and accuracy of data available about the oceans has increased dramatically in the last twenty years, including sea level, temperature, current flow, and salinity, which provide substantial economic benefit through better weather forecasting, as well as more accurate models to track the effects of climate change. One principal source of oceanographic data is “Jason and the Argonauts”. 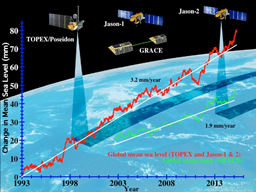 The “Jason” series of radar altimetry satellites collect ocean topography. The “Argo” system of 3,000 free-drifting ocean floats collect temperature and salinity data. Together, these and other monitoring systems provide us an unprecedented ability to monitor, model, and predict the ocean’s effect on humans and human’s effect on the ocean. To demonstrate the precision of the oceanographic data available, Dr. Lindstrom showed a map of the changing ocean salinity that identified not only longstanding features such as freshwater runoff from rivers and increased evaporation from hot, dry regions, but also how climate change is intensifying the water cycle, making freshwater areas fresher and salty areas saltier. This pattern is difficult to see over land, but the ocean shows the pattern clearly. Dr. Lindstrom next showed a time lapse video of sea surface temperature and wind patterns in the north Atlantic, illustrating how hurricanes are powered by energy extracted from warm ocean waters and how ocean monitoring systems can help predict and track their development. Another video demonstrated the phenomenon of “atmospheric rivers”, such as the historic rainfall that has inundated California over the last two years. In discussing ocean currents and their role in circulating temperature as well as debris, Dr. Lindstrom addressed the damage that plastics cause to the ocean. He noted that humans now dumping 8 million cubic tons of plastic into the ocean every year, much of which ends up as microplastics that permeate the food chain, including fish that humans eat. Dr. Lindstrom concluded by noting that the ocean is large but finite, and we can observe human impacts on the ocean. He characterized the ocean as a “great integrator” that reflects mankind’s engineering of the environment, for good or for ill. He noted that the ocean has thus far buffered us from the harmful effects of many of our changes, absorbing excess heat, carbon dioxide, and refuse, but it is not an inexhaustible reservoir for these societal externalities. He stressed that “we cannot manage what we do not measure” and reiterated that it is the role of policymakers to determine how these data should affect policy and regulations. One questioner asked about coral reefs. Dr. Lindstrom likened coral reefs to the rain forests of the sea, housing the greatest biodiversity on the planet. He noted that warming and acidifying oceans have already bleached and degraded them by 50 percent. They are resilient, he explained, but on a different time scale than human time. After the question and answer period, President Millstein thanked the speaker, made the usual housekeeping announcements, and invited guests to join the Society. At 9:56 p.m., President Millstein adjourned the 2377th meeting of the Society to the social hour.